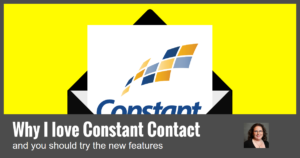 In case you are unaware, Constant Contact is an email solution provider. What does that mean? It allows organizations to send one-to-many emails to that organization's permission-based list. It has long been the industry leader, especially for small business. I have been a user since 2003 and the product just keeps getting better. I’m often asked why I love and recommend Constant Contact. First of all, I believe Constant Contact knows its market is the small business and as such has kept the platform easy to use and cost effective for small organizations. Plans start at just $20/mo! And you can always start with a 60-day fully-featured trial. They also have award-winning, patient, US-based customer support. If you spend more than 5 minutes on a question or problem within Constant Contact, contact Customer Support. They are amazing. Lastly, Constant Contact has made an investment in the local community by establishing local education teams who present best practices on email marketing throughout your area. Local marketing professionals like me. You can find my webinars and Washington, DC-area events at www.laurabcreative.com/calendar. Many of my events are free, thanks to the support of Constant Contact. Background Patterns. There are currently 8 different background patterns you can choose along with the ability to color them to match your branding. I've heard the ability to upload your own background images is coming soon. Import PDF to Email. This is amazing especially if you deal with another stakeholder who provides a PDF promotion like an event flyer. You can now import this PDF into Constant Contact and the system will create an image in the email that is automatically linked to the PDF download as well as a download button below the image. I encourage you to include descriptive text and details in the text of the email as well for those users who have images turned off. Specialty Blocks. These make it easy to add specific types of content above and beyond the general blocks that include text, images, videos, and social media links. Read More. Pull all the info from a blog post including image, title, first few lines, along with a link to the rest of the post. Poll. Ask readers a question and track their responses. RSVP. I have been loving this simple, one-click way for readers to RSVP for an event. That's just creating an email. There's also a ton of magic happening after you send your email. Segmenting with Tags. You can segment your lists based on who has a certain tag or who does not have a tag. This means you can segment by customers or location easily. Social Share. The new social share allows you to share your email on social media (Facebook, LinkedIn, and Twitter). I like to use this with clients to enhance their social media editorial calendar. New Email Archive. Simply place a piece of code on your website and then select which email campaigns show up in your archive right in the Constant Contact dashboard. I love the control and simplicity of this feature. We also want to serve our subscribers and manage our email lists. Send Welcome Email by List. I have waited for this feature for so long. Now you can send tailored welcome emails with specific content for each of your lists. Read 3 Autoresponders to Use in Your Business Right Now for tips on creating your welcome email including a downloadable checklist. Do not overlook this important first contact that typically sees an open rate of 60-80%. Resubscribe Contacts. You can now send an email directly to a subscriber with instructions on how they can resubscribe. This is handy when a business associate or colleague has accidently unsubscribed. This is a great feature but should only be used for contacts that you've spoken to about resubscribing. Now you can make sure your emails are more effective with these great new reporting features. Mobile vs. Desktop Opens by Campaign. Now you can see how many of your emails are opened on mobile versus desktop devices across the last 50 campaigns in your account as well as in each campaign. Search and Compare Campaigns. Within the reporting section, you can search and compare results from campaigns. The compare feature will give you a graph showing key metrics. With this in mind, remember to name your campaigns so you can identify the subject and content of the email in the reporting section. Click Through Heat Map. Now you can see which links were clicked in your email campaigns by viewing the heat map of actual clicks. This is helpful if you have the same link, say to an event registration, used in a headline, button, and image. I know there are lots of options for email marketing but give Constant Contact a try. And if you are a past customer, I invite you to start a new free 60-day trial to check out all the cool new features.